Summer is a fantastic season to celebrate a birthday, and many summer birthday cakes include delicious seasonal fruits such as strawberries, raspberries, or blueberries. For a lighter cake perfect for a hot summer day, skip the frosting and decorate a vanilla sponge cake by drizzling fruit juices on the cake and topping it with fresh fruit and a sprig of mint for brilliant color and spectacular taste. A young boy with a summer birthday will love a construction themed cake that mimics the construction activity he has undoubtedly seen in the neighborhood or city. Toy construction equipment can be used to top the cake, and different candies, crushed cookies, and sprinkles can create the entire construction zone. Serve the cake with bright construction colored napkins, plates, and cutlery in yellow and orange to complete the setting. A light tiramisu can be a decadent summer birthday cake that isn't weighed down by heavy icing. Top the layers of tiramisu with summer forest fruits such as berries in a light glaze or juice, and ring the cake with buttery lady fingers tied with a festive ribbon to make the entire cake a precious gift. Cakes themed after popular summer sports are both creative and delicious for summer birthday cakes for children or teens. A round sphere cake can be decorated as a soccer ball or baseball, or a sheet cake can become a soccer pitch, baseball diamond, or football field. For an even more creative summer sport cake, use a blue-tinted glaze on the cake to create a summer pool scene. A chilled mousse cake can be a decadent delight on a hot summer day. Instead of just using the mousse between the layers of a heavy cake, use only one layer for the cake and top it with a thicker layer of fruit-flavored or chocolate mousse. Top with fruit, whipped cream, mint leaves, or other minimal decorations if desired. 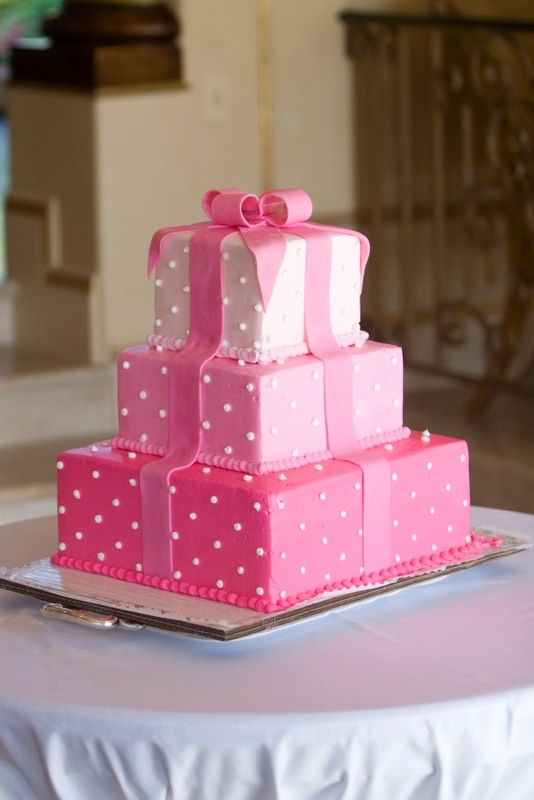 A square birthday cake decorated as an oversized present with fondant icing is a popular design in any season, and you can make this cake perfect for a summer birthday by choosing seasonal flavors and colors. A light fruit flavor, such as lemon or strawberry, is perfect for summer birthdays, or a white chocolate cake can have fruit mousse between the layers. For the decorative icing, soft pastel colors are perfect for an elegant summer birthday cake. No flower better symbolizes the bright rays of summer than the sunflower. A bold sunflower icing design is perfect for cupcakes or round cakes, giving them bright colors and decadent layers of sweetness. For more variety, use chocolate sprinkles or chocolate chips to create the seeds in the center of the flower and use icing only for the leaves and petals. On the hottest summer days, an ice cream birthday cake can be a delicious and refreshing treat. Use a spring pan to make a thin layer of sponge cake or brownie for the base, and then layer ice cream on top and refreeze the cake until ready to eat. Instead of icing, top the cake with crushed cookies, sprinkles, whipped cream, or popular sundae toppings for each serving. Icing can melt and deform on hot summer days, and large amounts of heavy icing are not as appetizing during a heat wave. Instead, decorate a summer birthday cake by creating a checkerboard sponge in the cake itself and leave the sides neatly trimmed but bare. Whip icing into a lighter texture for topping the cake, and don't forget a celebratory message. Citrus flavored cakes are popular summer birthday treats because they are light and refreshing. Orange, lemon, and lime are the most popular flavors and can be used individually or combined for a zesty layered cake. The citrus juice can be used to flavor the sponge cake or citrus icing or glaze can nestle between each layer. For an extra burst of flavor, top the cake with evenly cut slices or wedges of the signature fruit. A young girl will love a fairy tale birthday cake to celebrate her special summer day. Sweet pastel colors and a Candyland theme is a great option, or choose butterflies, hummingbirds, and fairies for a fantasy treat. Fondant icing can be the best choice for its ability to be molded into unique shapes, and it will hold up well in summer's heat for an outdoor birthday party with an accompanying fairy theme. Brightly colored cupcakes are perfect for every season, and bold colors and contrasting sprinkles are especially suitable for summer days. For an even more festive flair, serve the cupcakes not with candles, but with sparklers (properly supervised, of course!) to coordinate with summer celebrations.